Our New Hair and Beauty Academy! Being a bridesmaid is an honour, and it can be great fun! But it can also definitely be hard work. You’ve got hen dos and dresses to help organise before the wedding. You might be helping to organise decorations and guest favours in the run up, as well as helping your friend out on her big day too. That’s what bridesmaids are for, after all! We know that a wedding is always most stressful for the bride and groom, but let’s give those bridesmaids some attention! Here are our top tips for keeping you looking and feeling cool, calm and collected during your BFF’s big day. Yes, even if your bride is the most down to the minute organised woman alive, you’ll need to have your own plan for the day, for the bits that she isn’t around for. Make sure you know where your dress, shoes and accessories are before you go to bed, and if you have a clutch, pack it the night before as well. Get up on time, eat breakfast, and get showered nice and early. 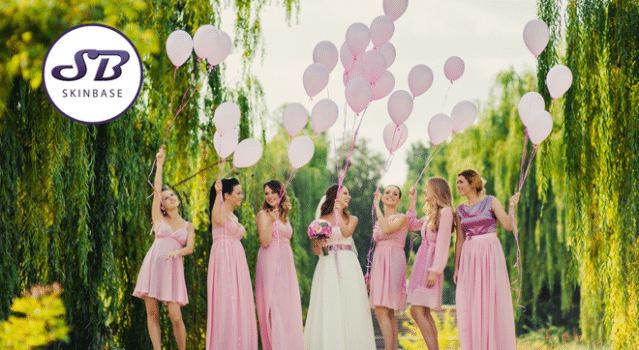 Many brides organise for their bridesmaids to be looked after on the morning of their wedding day, but just in case something gets missed, make sure you’re ready to be self sufficient, and be wherever you’re supposed to be at the right times. There’s a lot of standing and waiting around involved in being a bridesmaid, so pack heel cushions, blister plasters and anything else you can think of to keep your feet as comfortable as possible – and do your best to wear your shoes in before the wedding day! You don’t want to be gritting your teeth while you walk down the aisle, or wincing in pain in the photos. Perhaps this is less to do with being a good bridesmaid, and more to do with being able to enjoy the day with confidence! You’re going to be in a lot of photos and will be on the go for a long time. The best way to ensure that you feel confident and look great is to invest in your skin and take great care of it before your friend’s wedding. Why? Because makeup can’t cover blemishes forever, and you’ll want to spend the day celebrating rather than dashing to the loo to check on your complexion. A course of Microdermabrasion Facials will deeply cleanse your skin and can be used to treat a wide variety of skin concerns, such as spots and blemishes, pigmentation, ageing, dullness and uneven skin tone. The facial works by passing a fine jet of abrasive crystals across the skin, and then gently vacuuming them away using a light suction mechanism. The crystals remove dead skin and built-up grime, to reduce spots and eliminate blocked pores, whilst the vacuum effect stimulates collagen production for younger, fresher skin. The overall effect is a radiant, even toned and smooth complexion. Makeup lasts longer and looks better on blemish free skin as well. You’ll be able to enjoy your time as a bridesmaid so much more if you don’t need to worry about keeping your layer of foundation in check! We know how it goes…champagne while you’re getting ready, a toast right after the ceremony, all before you’ve even sat down for the meal and been offered water by the waiting staff! If you have anywhere to keep them, have bottles of water on hand for you, the bride, and the rest of the bridesmaids, and if not, ask hotel staff for a jug and some glasses. If your bride hasn’t suggested it already, she’ll be so grateful that you thought of it.